New curly hair emoji keyboard from Dove. 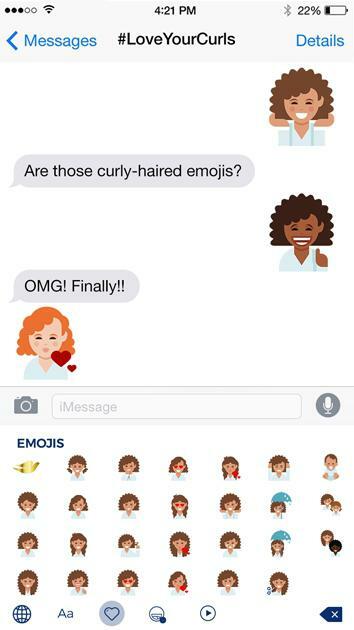 Now You Can Have Curly-Haired Emojis on Your Smartphone. But Where Will It End? On Wednesday, Dove announced free emoji keyboards for iOS and Android that depict all different types of curly hair on racially diverse women. In spite of increasingly frequent emoji updates from the Unicode Conosortium (which sets emoji standards), curly-haired emojis have never appeared. So as part of Dove’s Love Your Curls campaign, the company took matters into its own hands. The curly keyboard offers skin and hair color variations on 27 curl styles for a total of 131 curly-haired emojis. Rob Candelino, the vice president of haircare at Unilever (which owns Dove), said in a press release, “Dove Hair is committed to redefining traditional standards of beauty and ensuring women and girls see accurate reflections of themselves in the world around them.” He added that one-third of women in the United States have curly/wavy hair. Curly emojis seem to be something that people have specifically wanted. An emoji with curly hair and braids is a must . Tearing down beauty norms and offering depictions that women can identify with is a great thing. As Slate has noted, adding racially diverse emojis was a crucial step on Unicode’s part. It was shameful that they weren’t present in the emoji library from the start. And emojis should be whatever people want them to be. But as the library of options stops playing catch-up to a diverse and inclusive baseline and starts adding more niche representations (I have more freckles than this emoji but fewer freckles than that emoji), things could start to get out of hand. No one wants to scroll through a crushing volume of emojis every time they need a ghost. The most complicated aspect of the “Dove Love Your Curls Emojis” is the same issue that always comes up with Dove campaigns: Dove sells beauty products. No matter how pure the Love Your Curls intentions, there’s no avoiding the fact that Dove wants to sell products to women with curly hair. When Slate writer Katy Waldman wrote about Dove’s efforts to glorify armpits in 2014, she noted that the company had also just launched a new line of deodorants. “The armpit can be authentically beautiful with the right product! That’s where Dove comes in,” Waldman explained. If curly-haired emojis mean a lot to people—“As a curly-haired person … it was frustrating for me as a kid to be unable to find a curly-haired doll,” said one Slate editor—then they should exist. And now they do! But it’s going to take a lot of emojis, and apparently a lot of #brands, to represent everything we want to see.